11/11/1918 During World War I, the 42nd Infantry had a full rainbow as their insignia but after the war, they cut patch in half to leave in Germany for fallen comrades. They sent three regiments in November, Marseille. No heavy artillery. No training it was the last German offensive. Germans attacked 31-mile line probed for weaknesses. 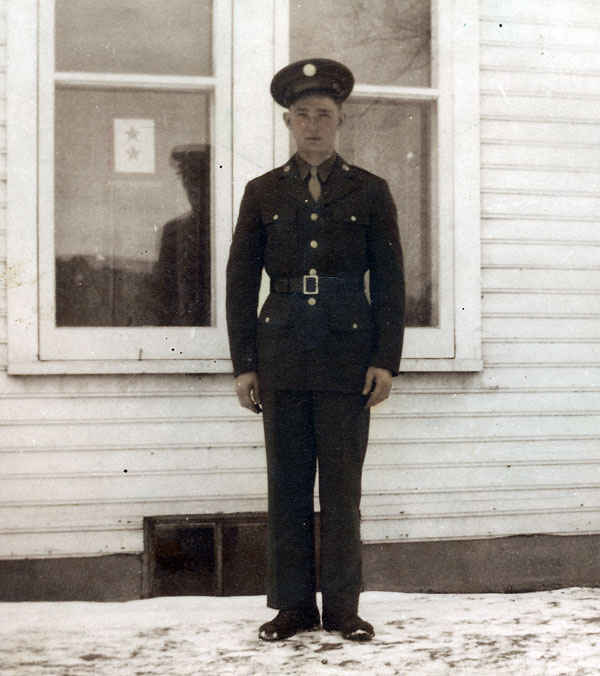 10/1944 When my grandfather was inducted into the service, the service men had to strip down and go through all the lines -- height, weight, shots before going overseas. One of the doctors giving shots had a bent needle for people he did not like and made sure they turned the needle to make it hurt. Luckily, they liked my grandfather and his shots did not hurt that much. Another needle had a spur on the end and it hurt when it came out. At that time, they used reusable needles. 12/1944 During basic training while shooting moving targets a soldier panned to the left on a target was going to shoot behind a gas port of person next to him. The Gunnery sergeant stopped him from firing. 12/1944 While qualifying for marksmanship, my grandfather’s gun was worn out, and the bolt came off by just shooting it. Some of them were fully automatic since they had been used so much. My grandfather qualified in almost all the areas including bazooka, mortar, rifle, grenade, carbine, marksman, Pistol, BAR, and bayonet. My grandfather fired a rifle grenade on a M1 in basic training, but he would never see this weapon in combat. 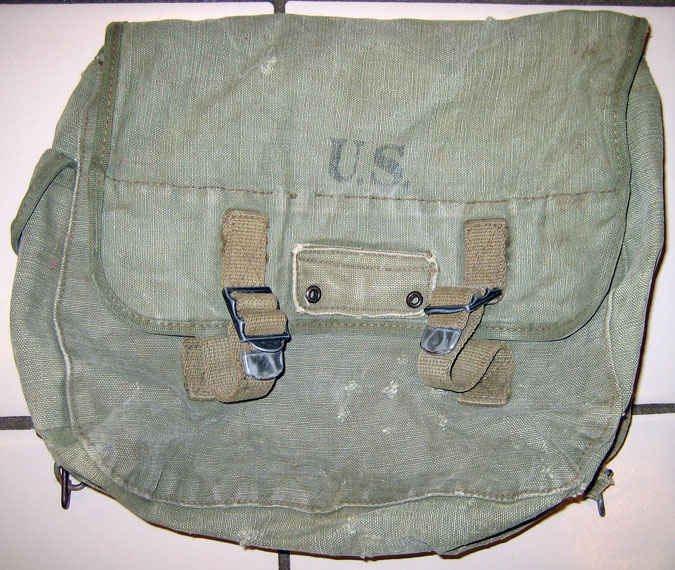 12/1944 My grandfather weighed 135lbs during the war, during basic training he had to carry himself with all his gear and another solider that weighed 200lbs with all his gear 1,000 yards. He actually made it! 1945 One time a mortar landed in the front of a little hill, shells exploded in front of my Grandpa and threw him in the air about 10 or 20 feet. He was shaken but relatively unharmed. 1945 My grandfather could disassemble BAR in seconds, so it would not be usable if they were captured. Parker was the BAR man, would sometimes use my grandfather’s back as a tripod. He was even better with the M1 his primary rifle. He would have to carry extra BAR ammunition with him since he was the assistant BAR man. My grandfather carried a clip of solid tracers that were often used to burn houses and train stations with snipers in them. It was the most effective way to rid towns of the enemy while minimizing danger. 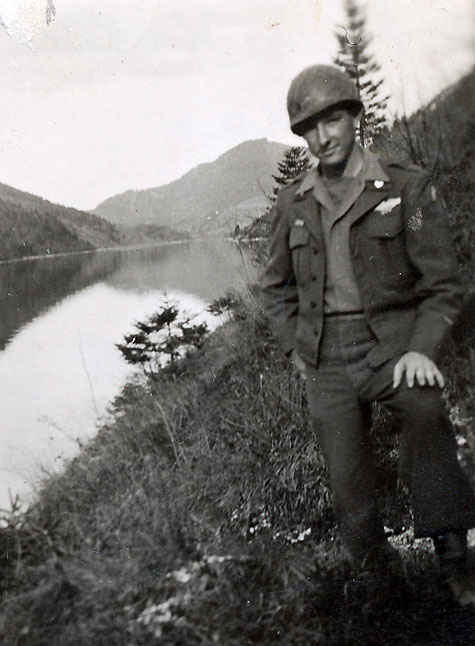 1945 My grandfather was standing on a bridge one day and looked down to see a 20-caliber pistol in the water, which he picked up and later mailed home. German’s would throw their guns away so they could claim anonymity from being a Nazi. My grandfather still has the pocket sized pistol. 1945 My grandfather did not smoke so his friends gave him money for his cigarettes and he sent the rest of his money home. 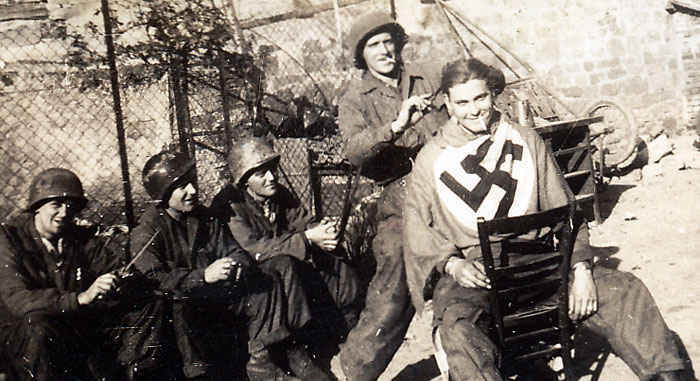 1/1945 The 42nd fought fearlessly, the Germans could not believe they were rookies. Hatten, France was a particular heavy war zone where the Germans could not take the lines. 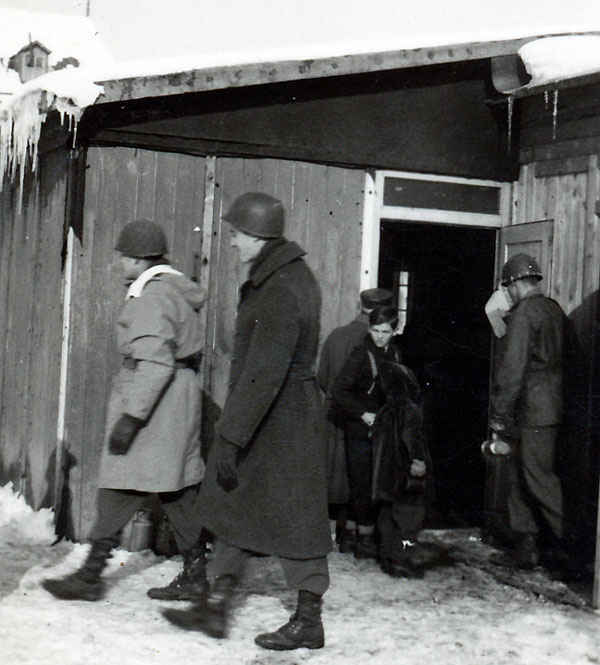 Locals said 1945-46 was the hardest winter in memory, including relentless patrolling of the rugged mountains in extreme cold temperatures which they had to endure as they went straight up and over the mountains many times. The 42nd crossed the Siegfried line first into Germany. He found Nuremburg to be extremely chaotic with hundreds of thousands of refugees.The 42nd surprised and attacked earlythe Germans early before they could retreat. 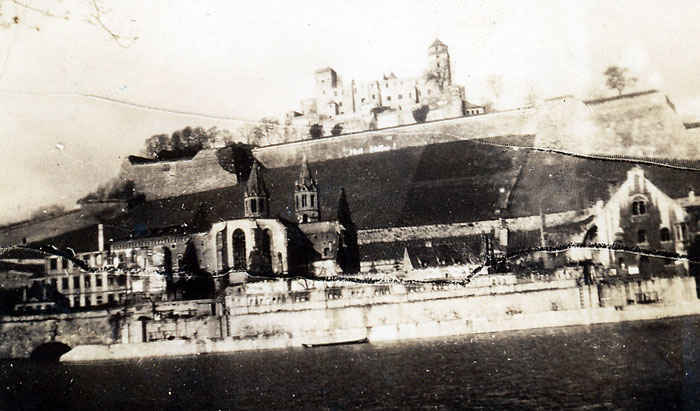 The 42nd also went through Danoworth , the hometown of Hitler, along the Danube river. In Munich, my grandfather captured a beer seller in the midst of all of the turmoil while the war was winding down. Throughout WWII, the 42nd covered 6,000 square miles and took 45,000 Axis prisoners. The 42nd believed that their duty was to NEVER FORGET! 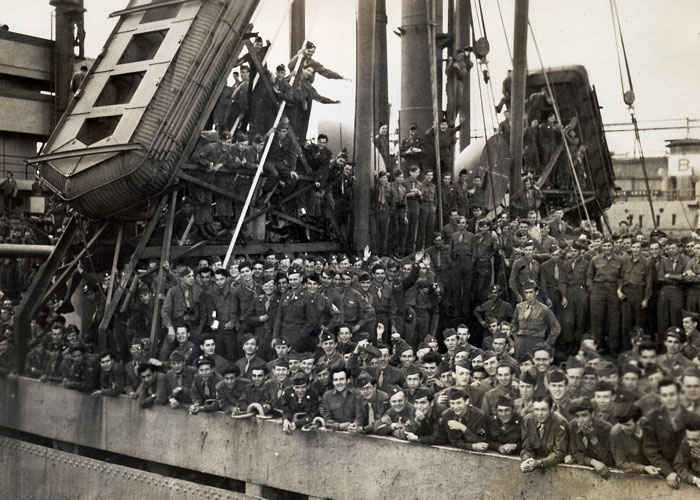 1/31/1945 When crossing the Atlantic on a merchant ship, 75% of men got sick. My grandfather stayed on top and did not get sick. He rode across the English channel in LST. January was terrible weather, and it rained everyday in England. My grandfather flew in a C47 after the war from Austria to France. 2/1945 In Grandpa’s unit: one company would take a town, one would hold it, and one would go through to take the next town. 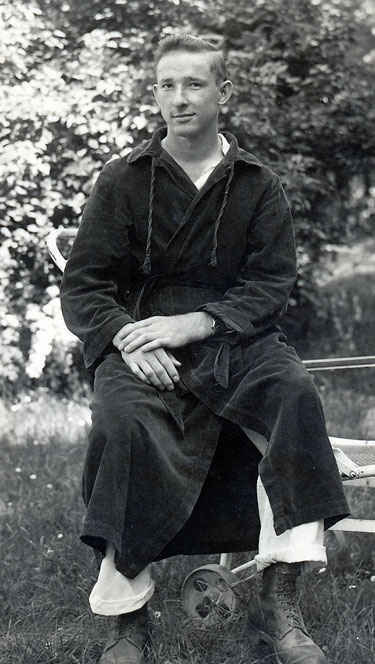 2/1945 He wore a white coat for winter when there was snow and then the green the rest of the year. My grandfather said one would burn up if it was not cold out when one would put the white fur coat on. 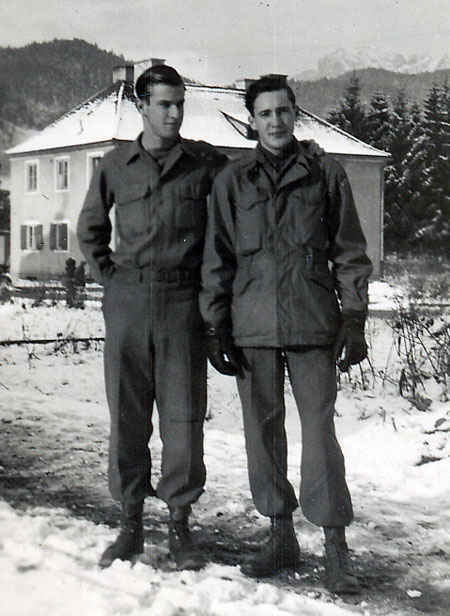 2/7/1945 My grandfather saw a lot of the war, even during the post Battle of the Bulge period. He said it was either kill or be killed. 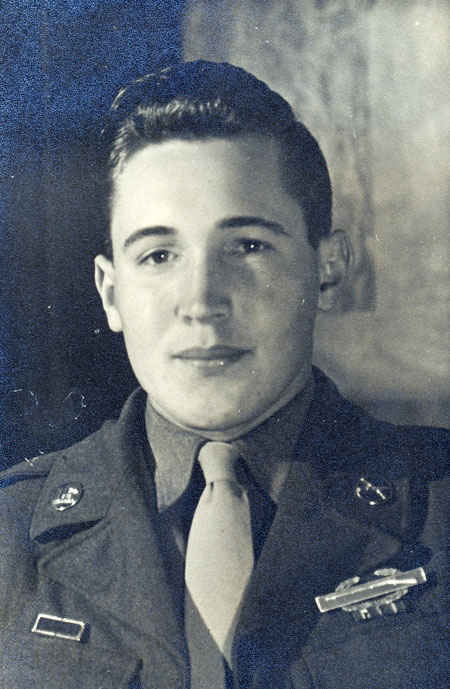 His company of men were the replacements for soldiers killed during the Battle of the Bulge. This is when his regiment the 242nd earned the Presidential Unit Citation. The 242nd regiment was wiped out in Hatten, France during Germany’s last offensive and this is where my grandfather started his tour of duty. 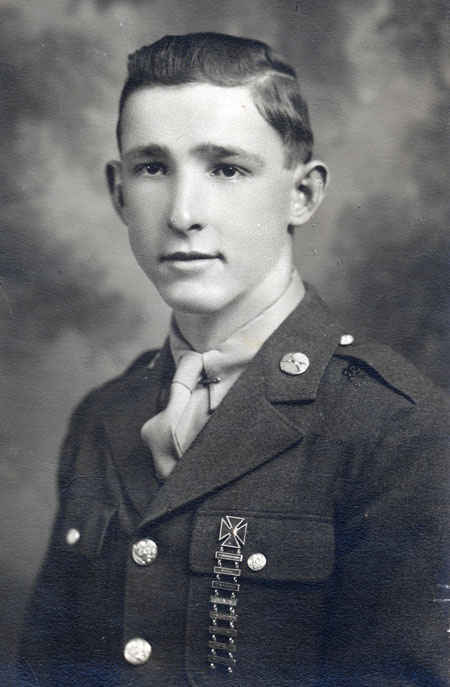 3/1945 My grandfather was in his foxhole on a hill one day and was told to come down from the front lines to his commanding officer’s headquarters. He thought he was in deep trouble on his way down. When he got to the commanding post, he said “what did I do, I did not do anything wrong.” The officer then presented his brother Donald who had hitched a ride on a mail truck to see him. Donald was in maintenance ordinance company. The captain said he and Donald could go back to my grandfather’s foxhole. Grandpa took off and Donald followed. When Grandpa looked back, Donald was far behind. Grandpa did not think he was moving that fast, but Donald was not used to that kind of exercise. The brothers spent the night together in Grandpa’s foxhole then Donald left the next day. It was a lucky opportunity to see his brother during battle especially as the next week my grandfather’s unit pulled out and the American’s overtook the hill. He had been on the hill in his foxhole for days or maybe it was weeks. 4/1945 A plane was coming in to blow up a bridge built by the American Army, whom my grandfather’s unit happened to be guarding. The soldiers noticed it was their own plane coming in low but could not communicate with the plane so they had to shoot down their own plane. The soldiers talked to the American pilot later who bailed out and he said it was a good thing they shot him down because he was going to blow up that bridge. 4/1945 Coming into town a woman sniper was shooting at them so they got a tank and blew the roof off, then a white flag came out. Occurrences like guerilla warfare were very common and something all the soldiers had to worry about. My grandfather said one had to worry about kids shooting at you. Germans often used tunnels to infiltrate American lines as well. 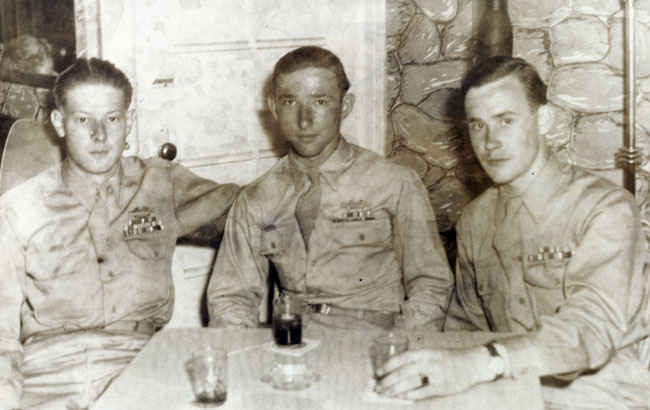 4/1945 On one occasion, every man in his company crawled under sniper fire to get two bottles of wine each in Germany. The Captain drank with every man. Commanders were mad they gave good wine away, but they were the ones who took the town, so they believed that they should be have gotten the best wine. 4/1945 Germans parked airplanes under over-passes and tried to hide them from the Allies. My grandfather was strafed by a German plane. 6/1945 My grandfather rode in a jeep up a mountain as they often did and he and the driver were gone awhile when the driver got sick and the driver did not know how they would get back to camp. Grandpa said he could drive them so he did. When they got back, the driver said he was glad Grandpa drove and did not know Grandpa could drive so well. Grandpa said, “Well you never asked me.” The driver was very thankful that Grandpa did drive them back or they might have got in trouble. 6/1945 My grandfather rode in a jeep up a mountain, as they often did, and were gone awhile when the driver got sick and did not know how they would get back to camp. Grandpa said he could drive them so he did. When they got back, the driver said he was glad Grandpa drove and did not know Grandpa could drive so well. Grandpa said, “Well you never asked me.” The driver was very thankful that Grandpa did drive them back or they might have got in trouble. 7/1945 One day a Prisoner of War pushed my grandfather just out of the blue; my grandfather was only a 135 lbs and fell onto his wrist and broke it. His friends then educated the POW. While my grandfather was in the hospital, they lost all of his stuff. Then to top it off, he found out he had a hernia and had to get an operation on that as well. He said they numbed him from the waist down and he watched the operation from the reflection on the light fixture. 8/1945 My grandfather sent back two 8MM mouser’s from an armory but someone stole one while en route to home, so only one got back safe. The military shipped war prizes for free. My grandfather said one could jam mouser bullets into M1. 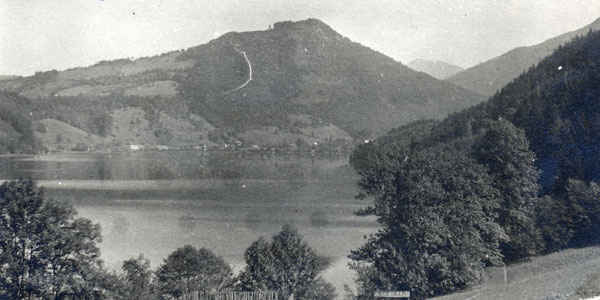 1946 After the war ended, my grandfather went on a 100 mile trek to get to Hitler’s The Eagle’s Nest. It was a very treacherous trip to go up the very steep mountain one level after another, you really had to be in shape and have a good jeep to make it. He looked out of Hitler’s huge picture window, which was most impressive. There was also a huge underground city that was guarded by soldiers. It was so massive; service men would get lost and never find their way out. 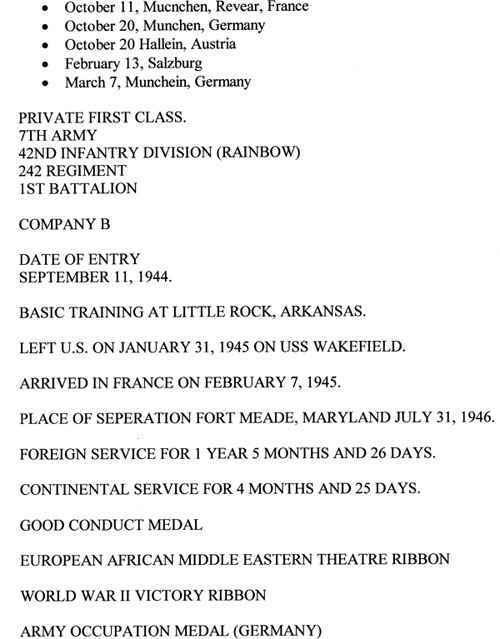 1946 A shavetail captain with no war experience came into my grandfather’s unit after the war was over and decided he was the boss. The officer kept trying to get them into trouble to stroke his ego. The men decided they were going to teach him a lesson. Their sergeant said the shavetail was coming out to monitor guard duty so they waited until he was out in the middle of the camp and they took their M1’s and started shooting at him around his feet without hitting him to show the officer who the real soldier’s were. No one had a problem after that incident. 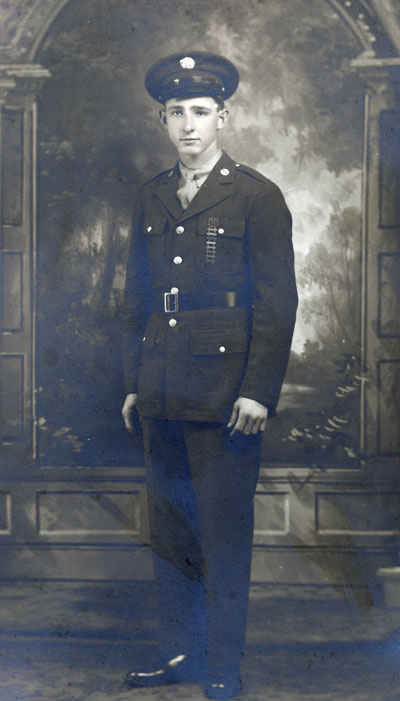 1/1946 After the war, my grandfather was a guarding motor pool. An officer wanted a jeep but did not have pass, the officer said he was going to have my grandfather’s job but by this time my grandfather knew that the officer was trying to get him in trouble so he clicked his safety off and pointed the gun at him and said no. My grandfather never heard anything else about it. 7/1946 My grandfather brought some armored piercing bullets home. He went back into a woods one day and put a one inch thick steel plate in front a of a tree and shot if from 100 feet. The bullet went straight through the steel and through the tree. He disassembled another bullet and used it as a center punch. 7/1946 After the war, my grandfather came into NY. Since my grandfather had a combat infantry badge, the bartender gave him free beer or coffee. The cab driver routinely took soldiers to the train station for free and gave them directions on how to get home. In basic training, hitch hiking was a normal way to get around to places. Taxi drivers requested soldiers’ serial numbers because there were too many incidents of people dressed in soldier uniforms robbing taxi drivers. 1980 In the early 1980’s at a steel foundry, a huge steel roll fell and my grandfather jumped behind some columns because he said it sounded like German 88’s coming in as the ground shook. 9/3/2005 My grandfather, after sixty years, finally agreed to tell his whole story for the first time since the war ended to his grandson. Bronze Star, European-African-Middle Eastern Campaign Medal with Two Battle Stars (Rhineland and Central Europe), World War II Victory Medal ,Interallied Medal? Not official?, Army Of Occupation Medal (Germany), and Good Conduct Medals from World War II. 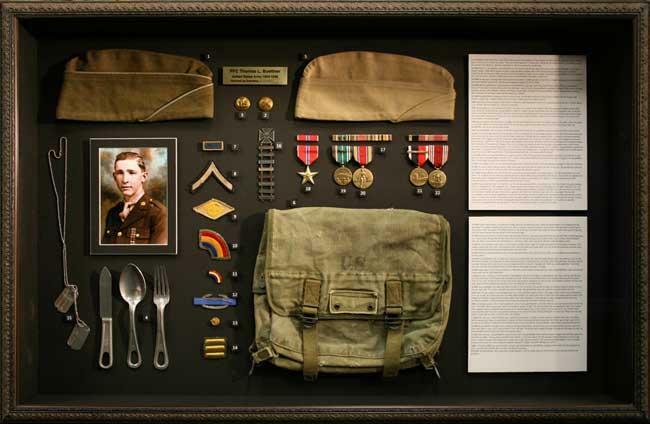 Frame of all Thomas' artifacts from World War II. 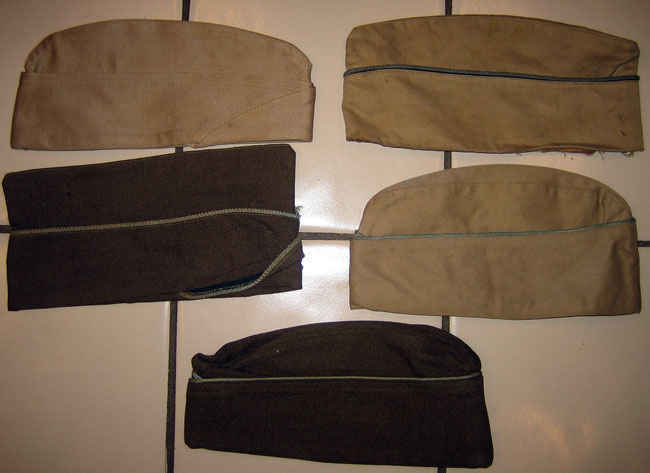 My grandfather's uniform accessories. Starting at the top left and going clockwise. 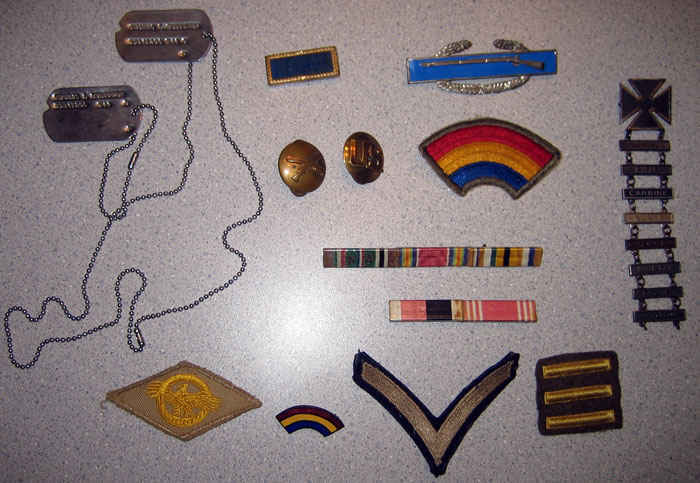 Dog tags, presidential unit citation, infantry lapel, combat infantry badge, 42nd division (rainbow), qualification badges, ribbons, three 6-month overseas bars, private stripe, 42nd pin, and ruptured duck. 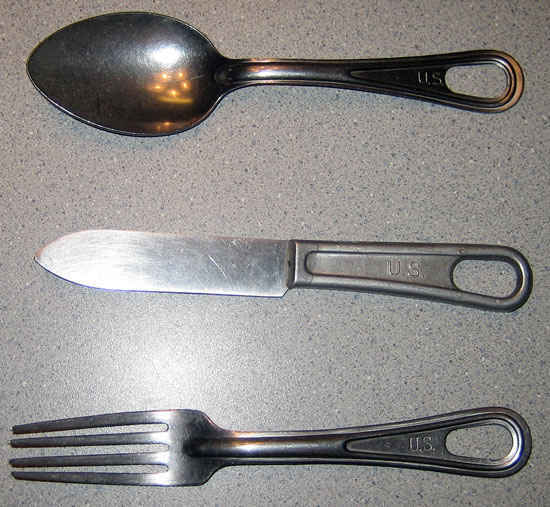 Utensils used by my grandfather. He said that the spoon was the best one and he used it for everything. The spoon is much larger than a tablespoon. To the left Thomas and Donald Buettner in Austria. Schweinfurt, Germany liberated displaced persons. There is a 12 foot hole in the ground near this picture where my grandfather and 5 other guys spent the night. New York City from Europe. Soldiers would take a taxi to the train station. Taxi drivers would give good directions to the soldier's and even gave them free fair. There were impersonators who would wear service clothes to abuse this courtesy. July 1946. This one of the pages in the tour excursion book. 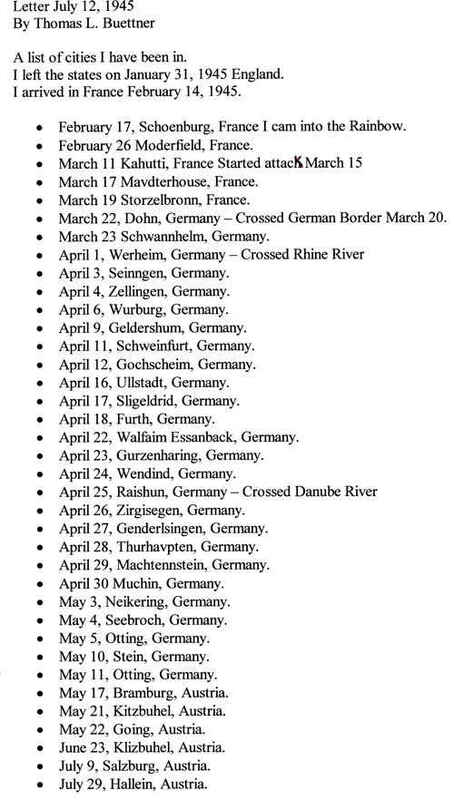 My grandfather went to all of these places listed. 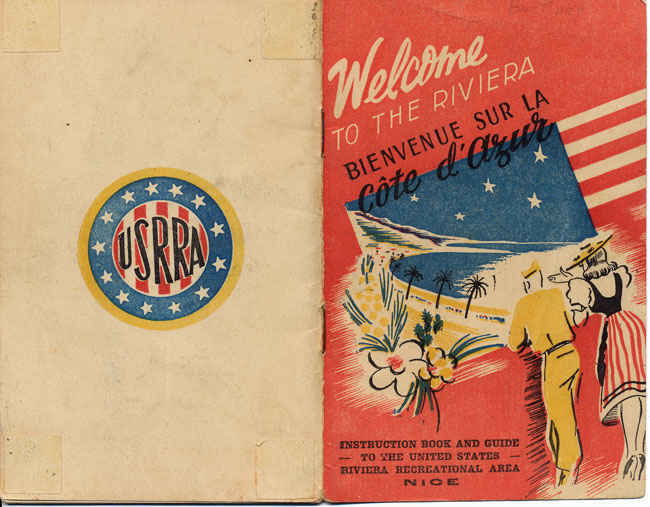 Riviera guidebook for post war soldiers. Taking tours after the war by service man was highly organized and very popular. 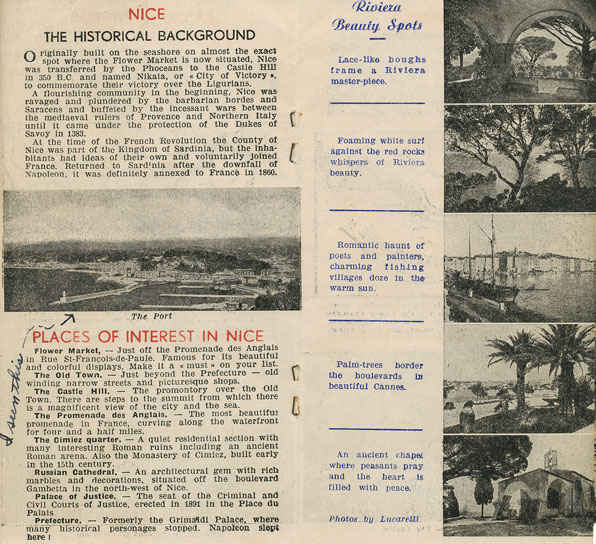 My grandfather went on a 7 day tour of various locations in Nice, France after he was in the hospital to recuperate. 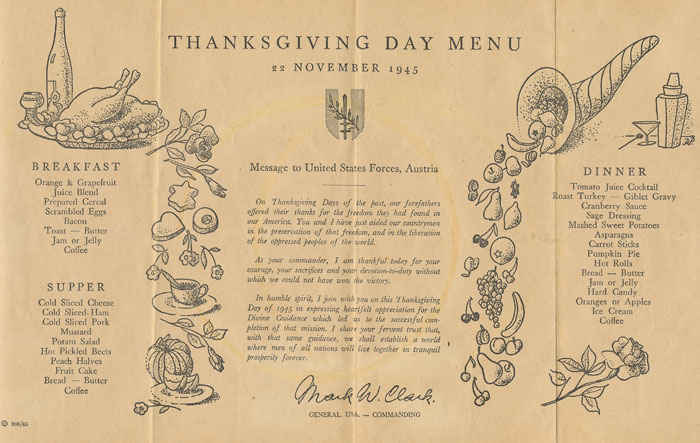 Thanksgiving day feast, November 1945. Parker and Betty in Hallein, Austria. Parker was the BAR man and my grandfather was the assistant BAR man. Parker was my grandfather best friend during the war. Far left top row is my grandfather and to the right of him is Parker. Shortly after this picture was taken in July, 1946 a plane flew over and dropped a bomb that landed 40 feet away. My grandfather said he moved pretty quickly during that episode. 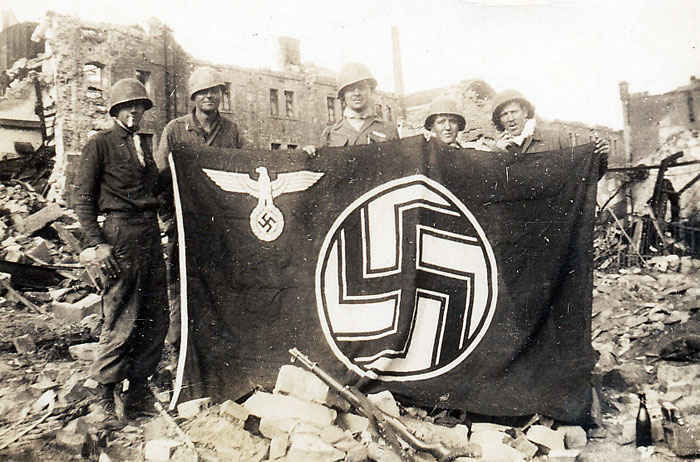 Notice that date of July, 1946 the war had ended in Germany by that time, something does not seem right. Germany surrendered on May 8th. This is my grandfather's brother Donald. 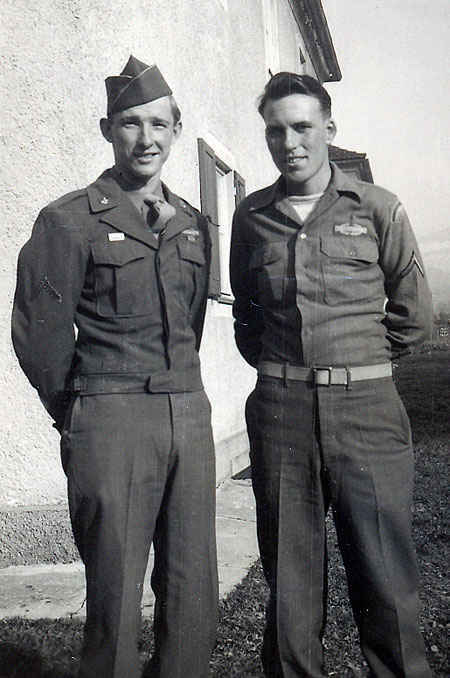 Donald was part of the 93rd Ordnance maintenance company and was actually able to meet up during the post war which is pretty amazing considering the millions of soldiers who were overseas. In Hallein, Austria my grandfather stand in front of "his house." 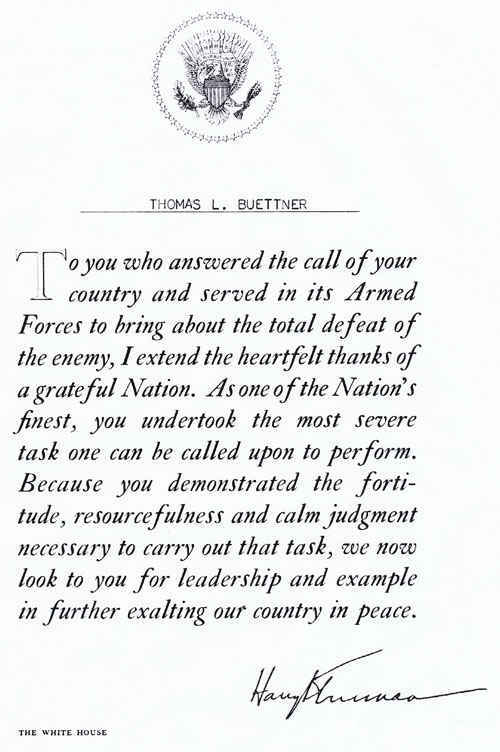 Letter from President Truman. 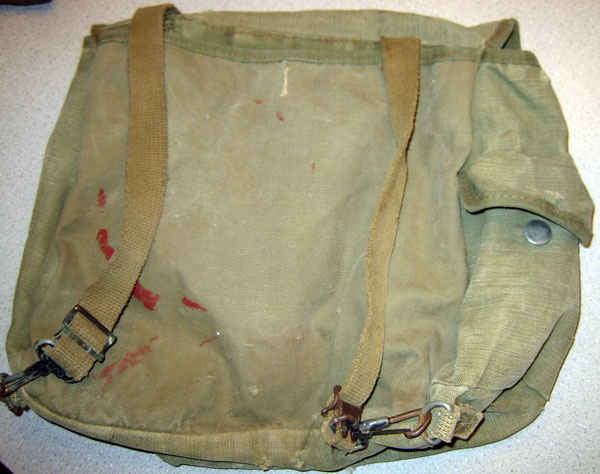 Every service man received one of these upon discharge. 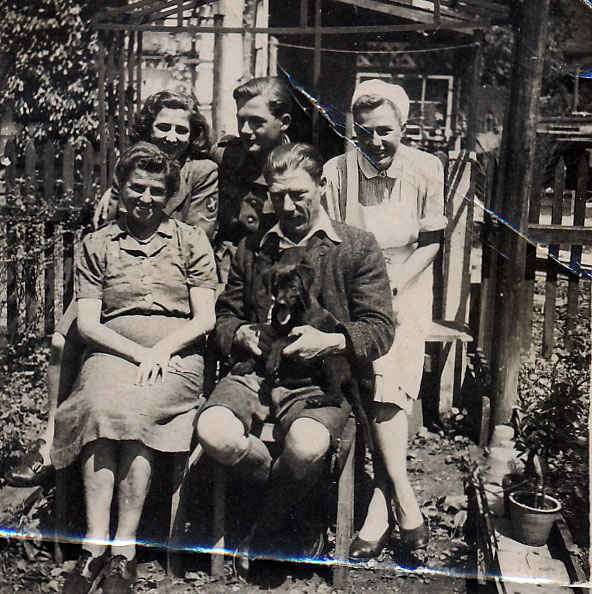 This is the Austrian family my grandfather stayed with after the war ended in Hallein. Staying with a local family was known as billeting. Billeting essentially means quarters or barracks and this was a frequent occurence for soldiers in post World War 2 Europe. Billeting by the British in colonial times was one of the causes of the American Revolutionary War but my grandfather did not have any problems. Picture of my grandfather before he left for Europe on January 18, 1945. Notice the flag in the window, each star stood for a soldier in the war. One for him and one for his brother Donald. The flag was known as the "war mother's flag." A gold star stood for a soldier lost and a blue star stood for a soldier in harm's way. 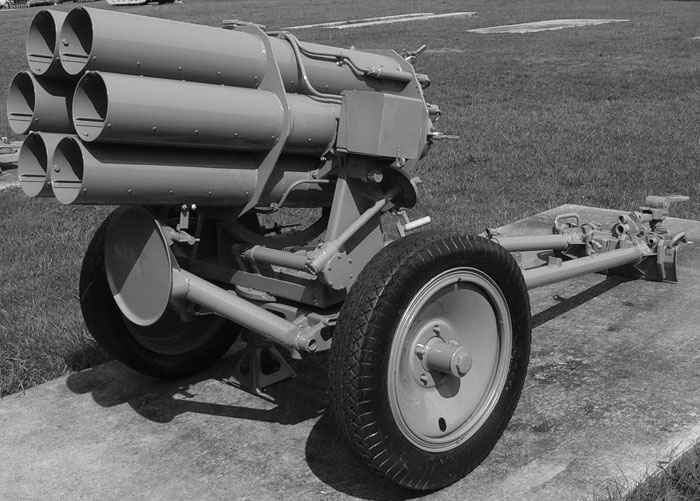 The Nebelwerfer had six 150 mm barrels, from which it fired 75 pound rockets; a full salvo spread over a period of ten seconds. The loud screeching noise of the rounds led U.S. soldiers to nickname the gun the "Screaming Mimi." My grandfather said if you could hear it scream you did not have to worry about because it was going over your head. However, if you did not hear anything you could get hit at anytime. 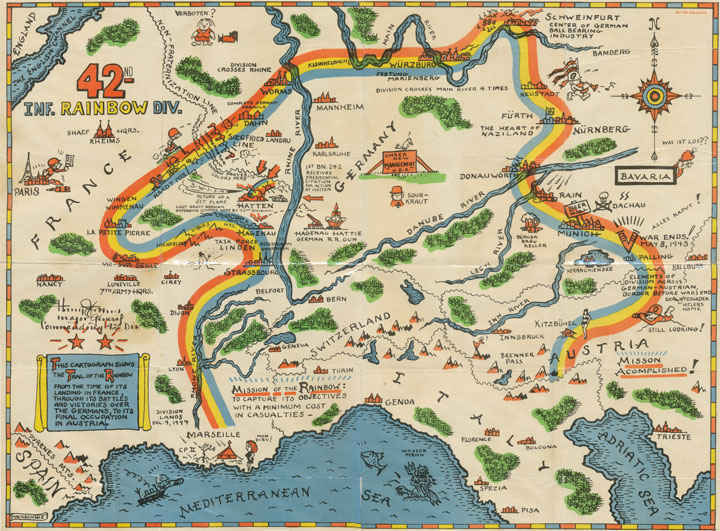 Map of 42nd Infrantry Division (Rainbow) across Europe. Assigned to VI Corps, Seventh Army part of Task Force Linden. 42nd consisted of three regiment (222nd, 232nd, & 242nd) . 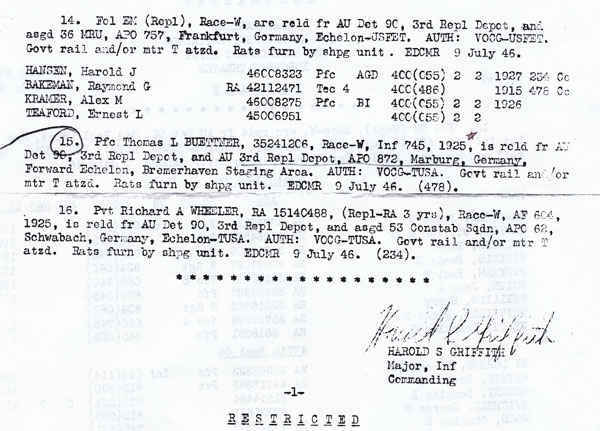 42nd earned battle stars for Central Europe and Rhineland. Hallein is a town in the Austrian state of Salzburg. 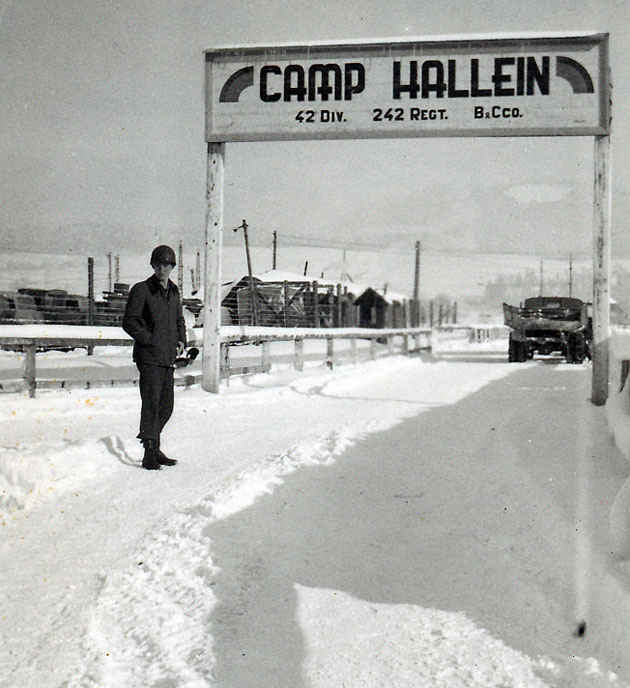 Hallein was the site of a work camp annex to the Dachau concentration camp but when my grandfather's regiment 242nd liberated it, the US Army used it as a prisoner camp. 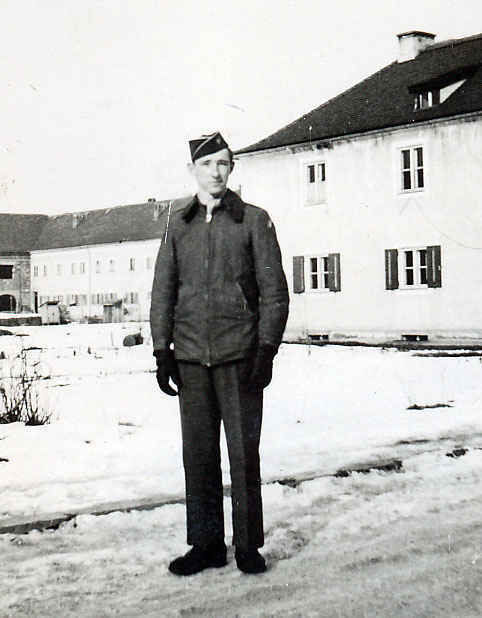 My grandfather spent much of his time overseas guarding prisoners in Hallein once the war ended. Qualification badges awarded to my grandfather in basic training. Various colors of army hats worn by my grandfather. Bronze star awarded to my grandfather. Back of the pack used by my grandfather. Pack used by my grandfather. 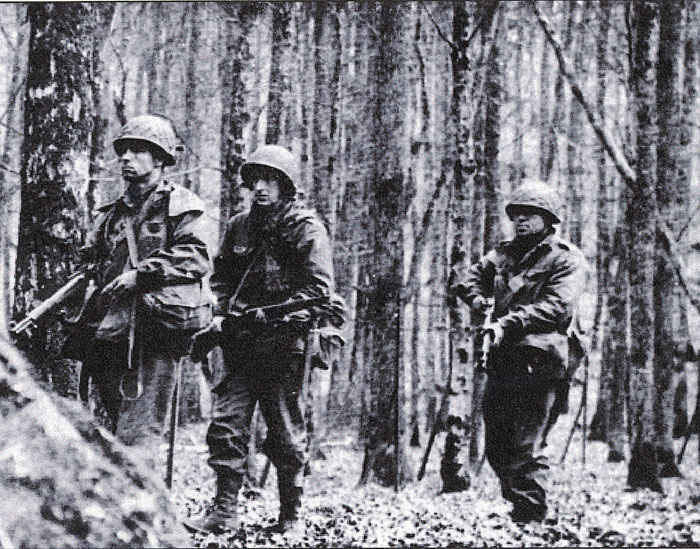 This is a picture from the 42nd infantry division book. We think my grandfather is in the middle. My grandfather said that he went through many forests that looks like this picture and often times a camera man was there taking pictures. Left Roger Beach and Ralph Coy. Belts giving haircut to Parker. 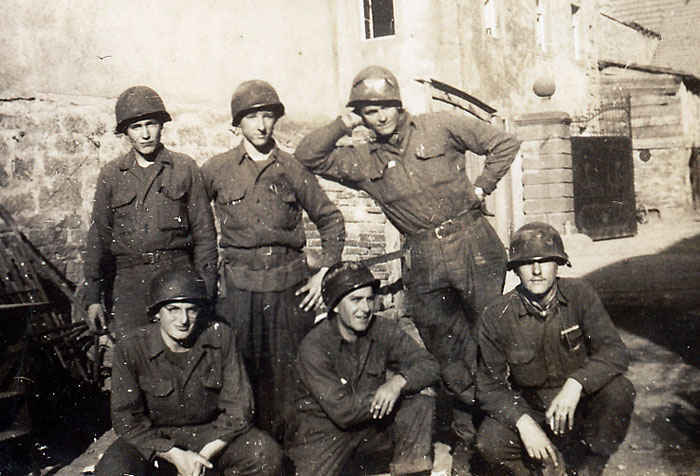 My grandfather second from the left. My grandfather Munich, Germany General Hospital May 1946. 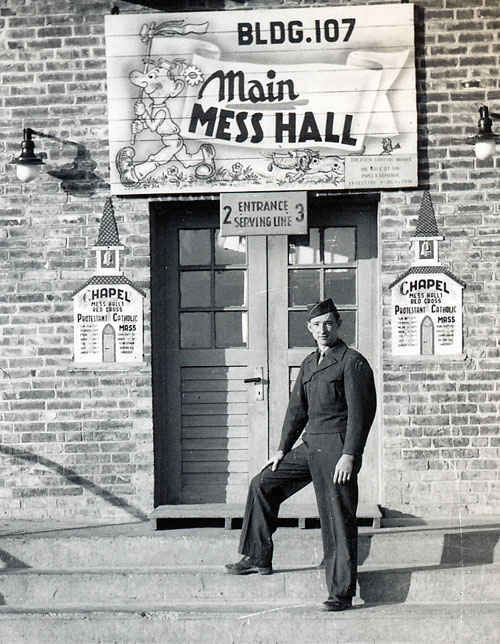 Main mess hall included a Catholic church, red cross, and a Protestant church. 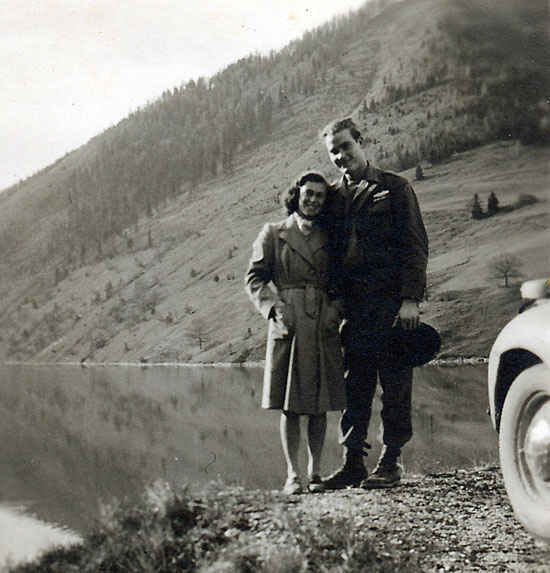 My grandfather by a Lake in Hallein, Austria. Hallein, Austria. 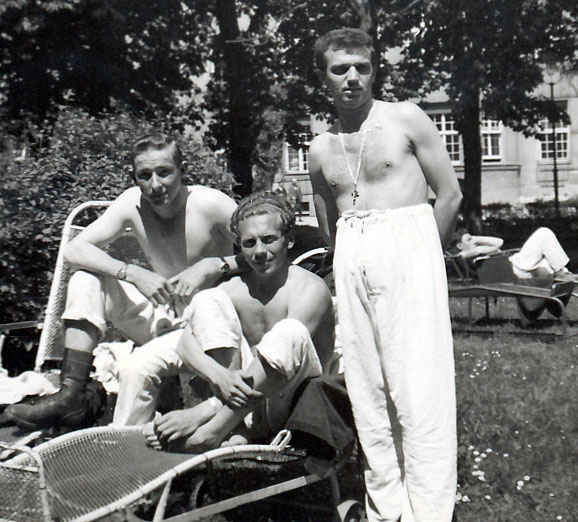 My grandfather to the right. 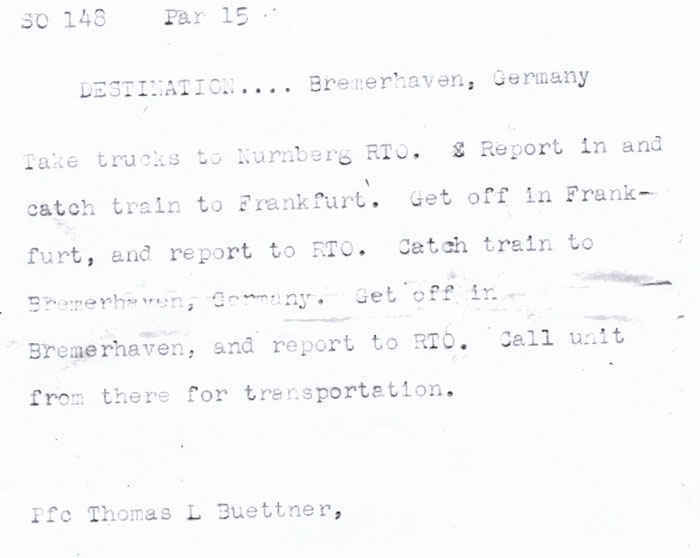 Second part of the typed up letter that my grandfather kept track of all the cities he was in. This is a typed up letter that my grandfather kept track of all the cities he was in. 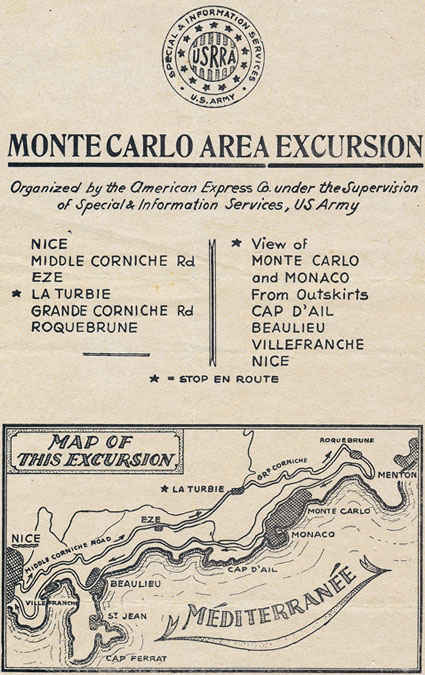 Monte Carlo excursion option, my grandfather did not go on this one. 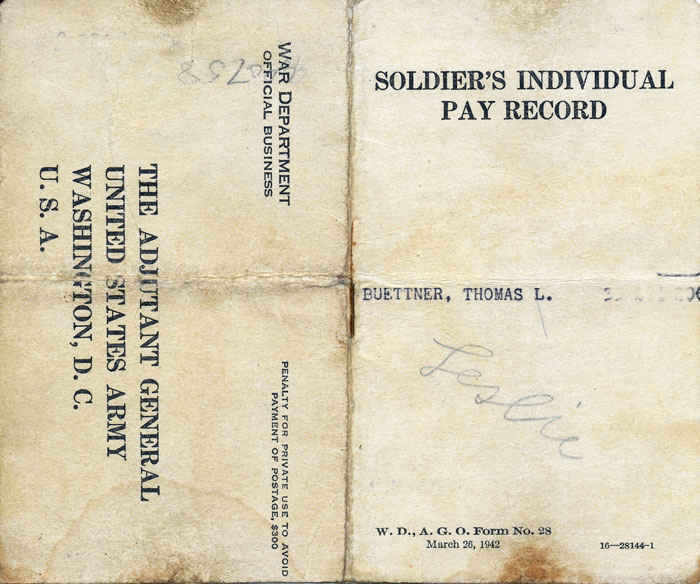 Soldier's individual pay record book. Was to insure soldier's against delay in receiving their money. Picture of the Westminster Victory, this is the ship my grandfather rode back on from Europe to New York City. Go up about two inches from the bottom and one inch from the right and you can see him marked with a dot. When one got off the boat there were photographers and the soldiers would give them money to mail the photos to their home. This is a typical letter that my grandfather wrote to his mother. 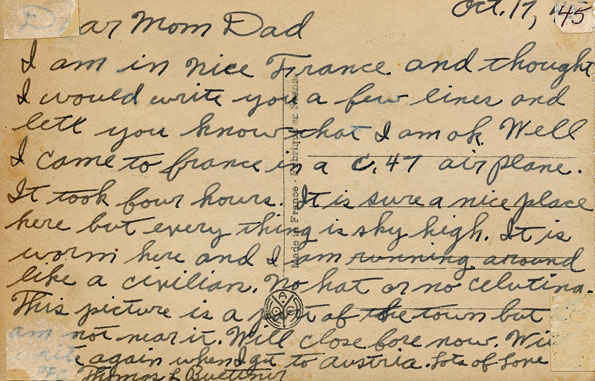 This letter talks about how on October 17, 1945 he rode in a C47 to France. 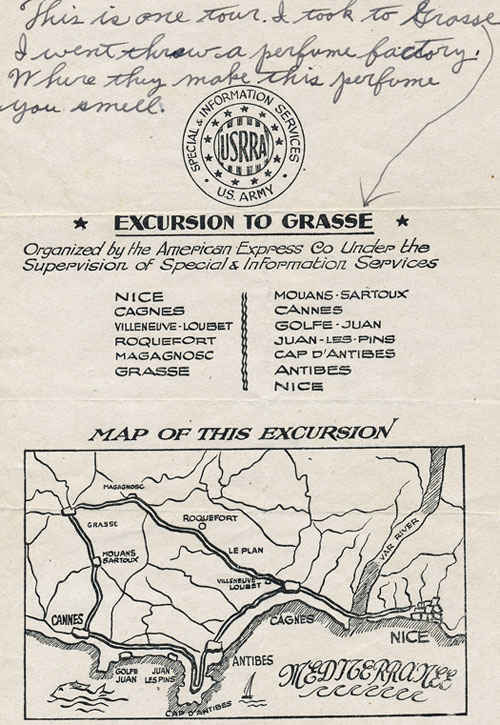 Excursion to Grasse in post war Europe. Can one imagine being 19 and 20 never being more than 30 miles from home and seeing the best that France has to offer. Munich, Germany 98 General Hospital, May 1946. My grandfather is to the left. 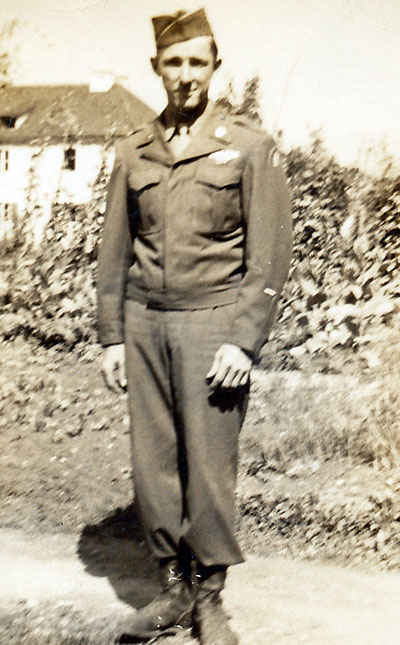 This is the last picture of my grandfather in his Army uniform. This was taken in New York shortly after he arrived on a merchant ship back from Europe, July 1946. Left Roy Brown, Thomas Buettner, Joseph Brooks. Hallein mess hall. Notice the kids outside looking for free donuts and coffee. 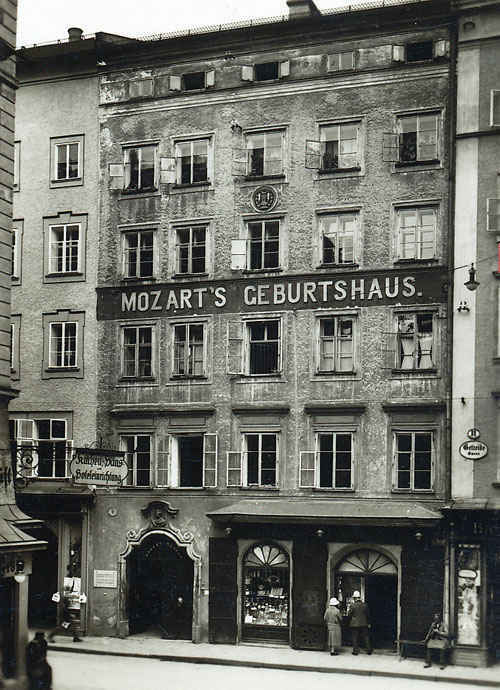 Picture of Mozart's in Salzburg which is Mozart home town. 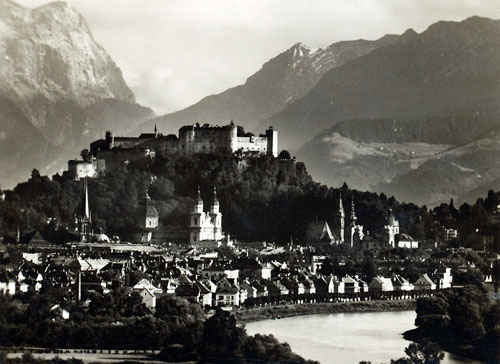 My grandfather saw many amazing historical icons in Salzburg. Pre entering the way picture of my grandfather. My grandfather on a water cooled 30 caliber machine gun guarding SS soldiers. 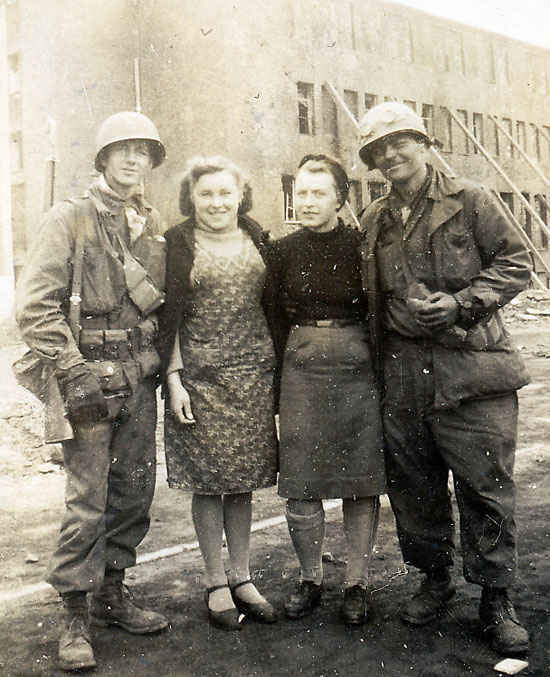 Schweinfurt, Germany near ball bearing plant in April 11, 1945.Schweinfurt was the location of most of the ball-bearing production in Nazi Germany. Even with many heavy raids against the ball bearing plant, Germany continued to produce ball bearings at high levels. 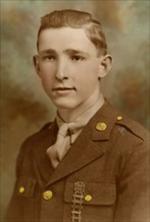 Picture of Ralph Coy, my grandfather was with Ralph start to finish. 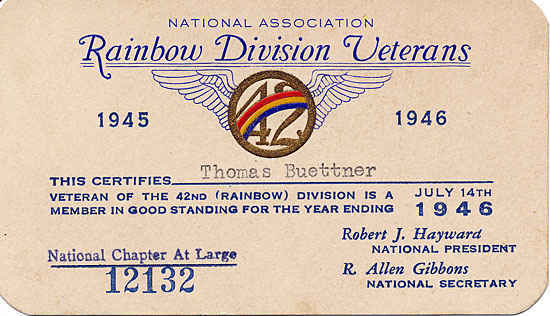 42nd Infantry card received after Thomas was honorably discharged. Pre Europe picture of my grandfather. Notice his skill badges, he pretty much has all of them. 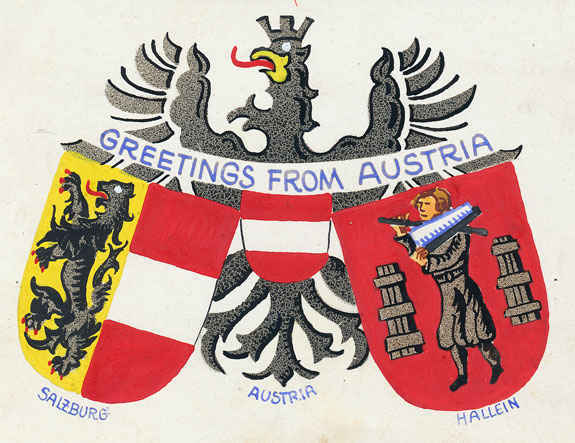 One of the many postcards my grandfather got in Austria. He had visited most of the places in all the postcards he received. "Piss call", as my grandfather calls it. 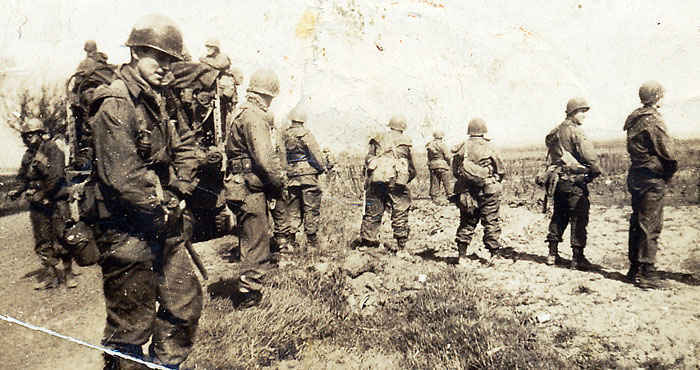 During the war my grandfather and his unit would march anywhere from 20 to 30 miles a day. Destination Bremerhaven, Germany. This is an example of an order. My grandfather broke his arm while mitigating a prison skurmish. When he went to the hospital in Munch, Germany he found out he had a hernia and had to have surgery for that as well. 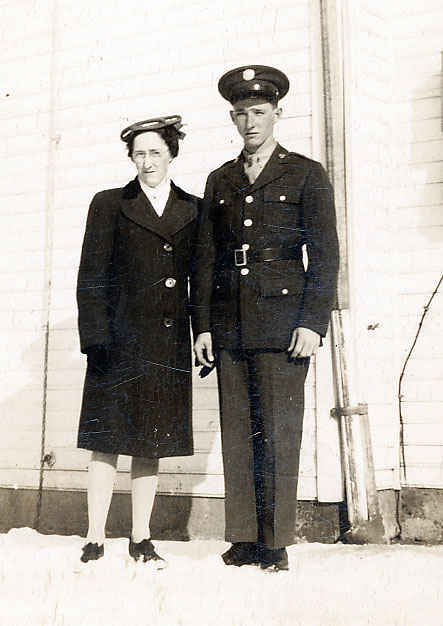 My grandfather with his mother before leaving for Europe, January 18, 1945. 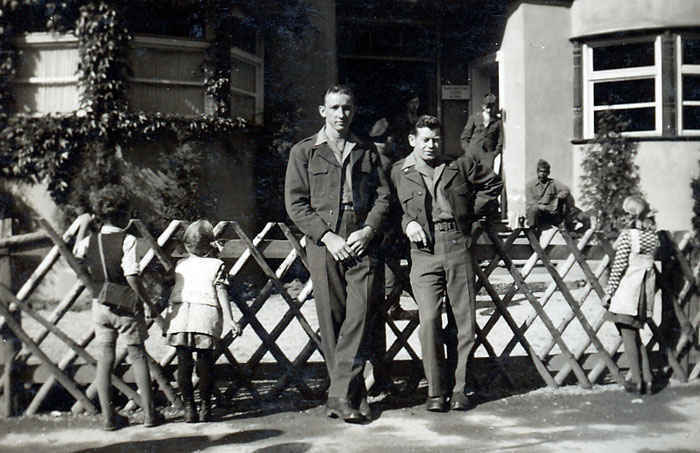 My grandfather in front of the Austrian house he was billeted in. 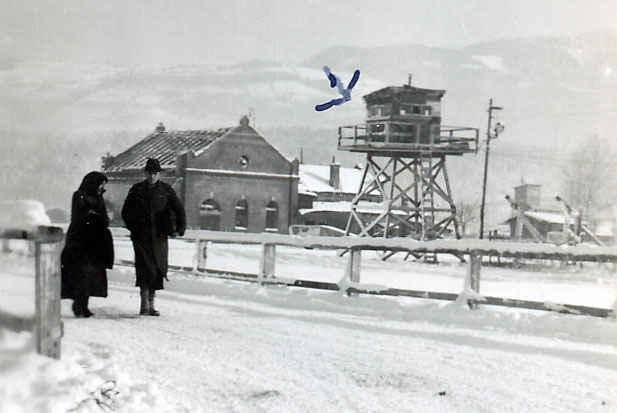 Guard tower in Camp Hallein. 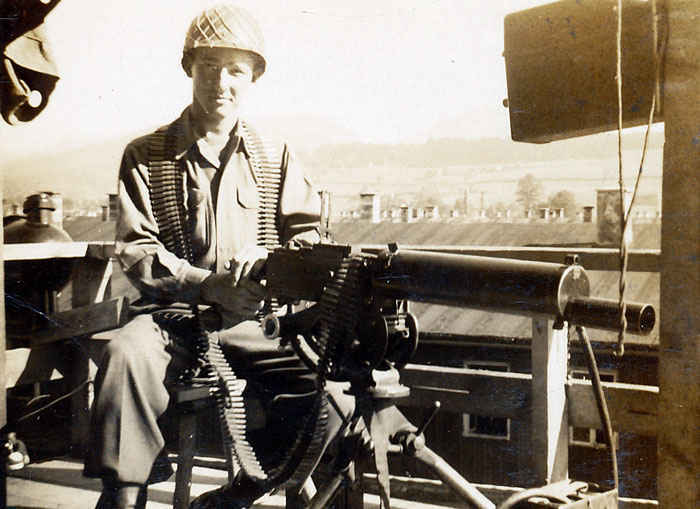 My grandfather spent most of his time in Hallein on guard duty. German woman's field hockey game. This is the order that sent my grandfather back to the states. 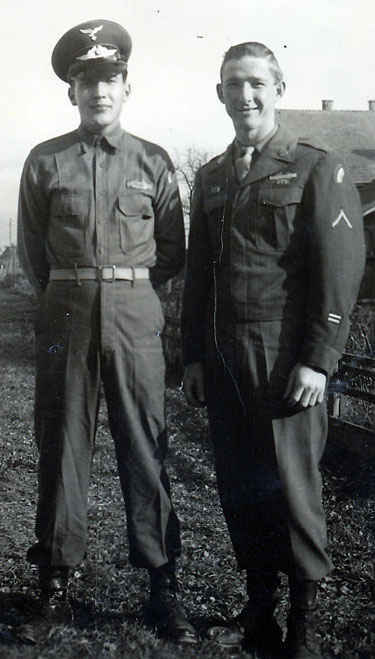 My grandfather to the left and Dessel White to the right in May 1946. 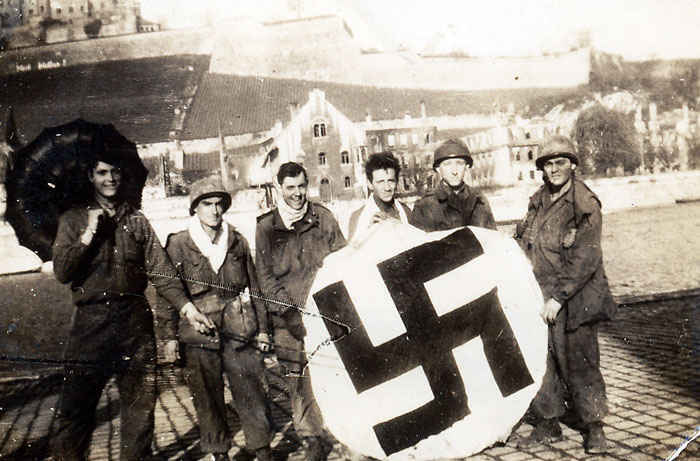 Wurzburg, Germany the first town that my grandfather fought in. 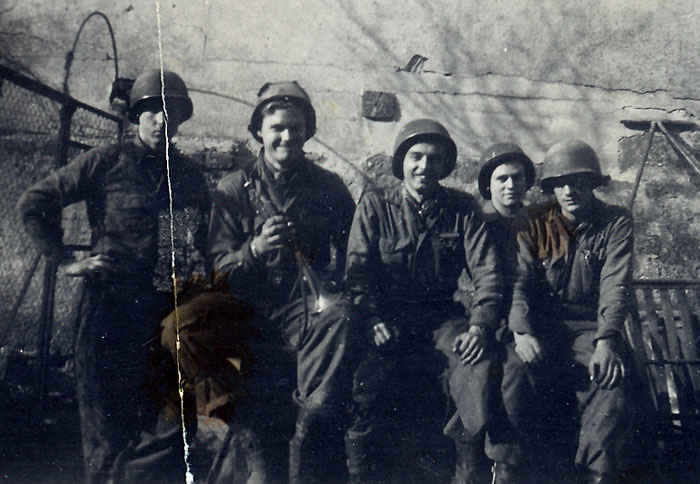 Parker is far left, my grandfather is second from the right. About 85% of the city was destroyed by Lancaster bombers. 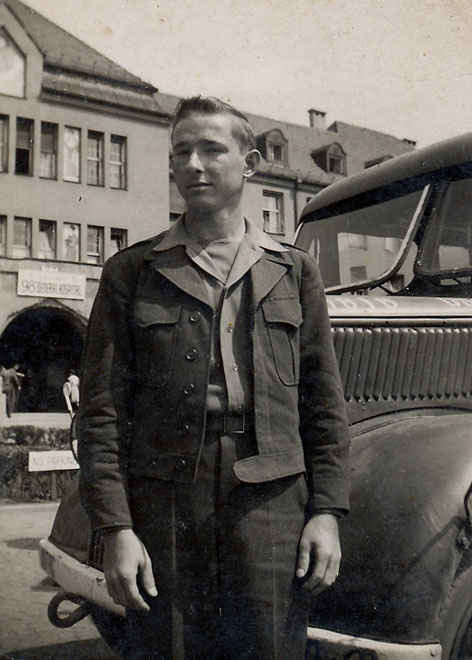 My grandfather arrived in Wurzburg a couple weeks after the fire bombing that destroyed the city. 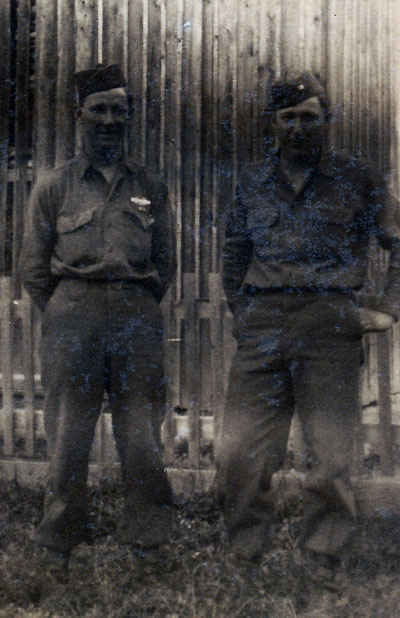 My grandfather to the left and Kenneth Becker to the right. 3rd Squad. Top row middle Thomas Buettner, top row right Parker. 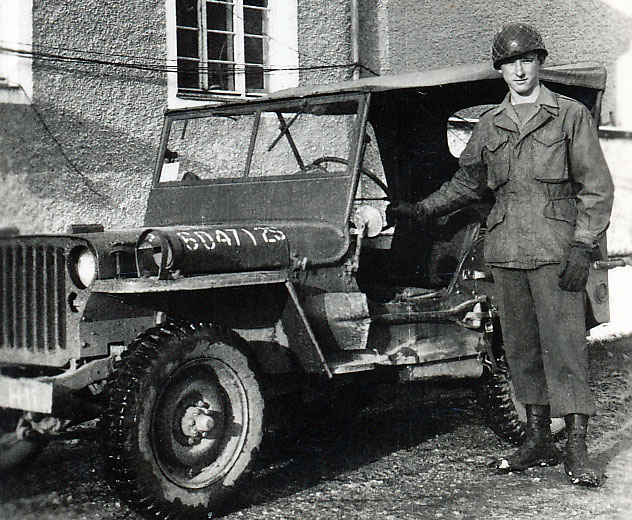 My grandfather next to a jeep in Camp Hallein, Austria. 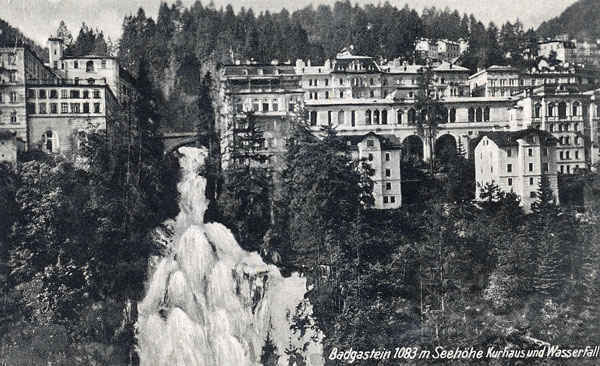 This is a postcard that my grandfather purchased from the PX in Hallein. We often sent post cards back to his mother in the states, letting her know that everything was alright and he was safe.